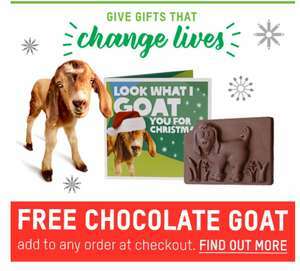 Order any poverty-busting Oxfam Unwrapped gift before 13 December and get a FREE solid milk chocolate goat. Don’t forget to add your FREE milk chocolate goat at the checkout. nice one, is great to remember those less fortunate at this time of year. It's the nanny state gone mad! It's crazy that so many people are donating chocolate goats that they have enough to give out for free! Someone should see their internal travel spend for meetings -- esp overseas - what a waste of money - what is wrong with Video Conferencing - complete waste of charity money!!! Really like the way they've set up donating to a good cause like a web-store of people you would like to help (since it may encourage more donations), but doesn't it just go into the same money pot regardless? Really like the way they've set up donating to a good cause like a …Really like the way they've set up donating to a good cause like a web-store of people you would like to help (since it may encourage more donations), but doesn't it just go into the same money pot regardless? The money that you, and thousands of others, spend on Oxfam Unwrapped gifts will support the full range of Oxfam's work around the world, from emergency responses to advocacy projects. Thank you!